How did I earn my Saint Lucia hat? I am now sporting the very latest in casual Christmas headgear, in the form of a Saint Lucia hat. It's my best Christmas present so far. But how did I earn it, please? I have turned hats on, and it seems that I can see that what I have earnt, but there's nothing telling me what each hat means, or what trouser-wettingly brilliant act on my part made it mine. And there's no [hats] tag on meta! So all you need to do to earn it is cast a vote on the 15th. There are secret hats, and how to earn them is not revealed on that page. Click on the snowflake in the titlebar, next to the icons that show new messages and rep changes. In the pulldown that is shown, click on the white "WINTER BASH" label on light blue background. This will show you a list of all (officially) available hats, with a short summary of how to earn each one. You can find it in the Winter Bash 2014 site. 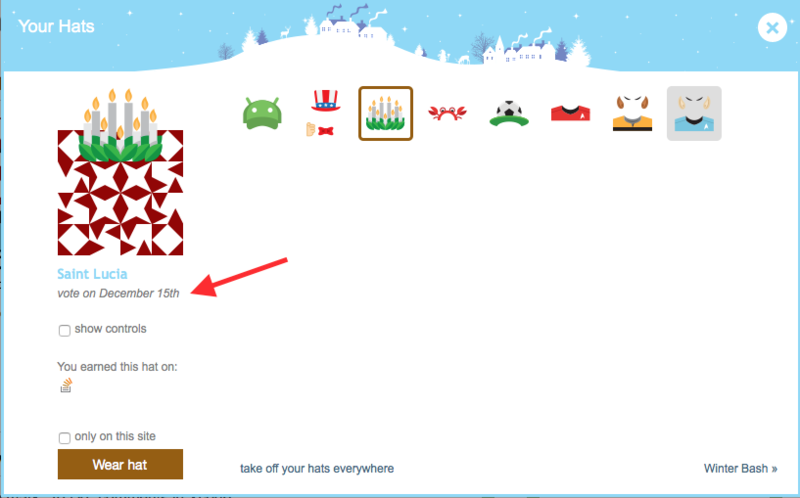 Also you can find it in the Hats pop-up, as shown in image. Not the answer you're looking for? Browse other questions tagged discussion winter-bash-2014 . Do I need to do more to earn Selfie hat? Did I understand the criteria for “Bill Lumbergh” hat correctly? What did I get the chameleon hat for? How do I earn the Batman hat? How do I earn the Odinson hat?